Adventist Mission | Who Are Adventists? Belize’s national flower is the black orchid, and the national bird is the keel-billed toucan. Spanning the length of Belize is the second-biggest barrier reef in the world, and the largest in the Western Hemisphere. It is considered rude to greet Belizeans by their first name, but thumb locking is a sign of greeting. To Sabbath School teachers: This story is for Sabbath, March 24. Click here for photos to share while telling the mission story. 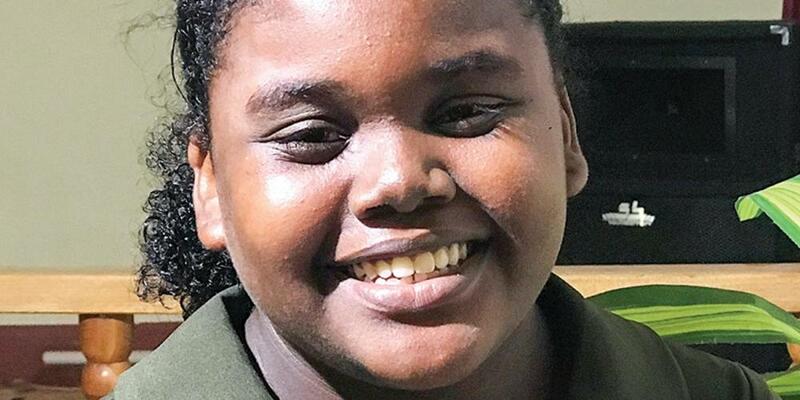 Eleven-year-old Tenira opened the front door of her house . Outside stood two men, and they asked to speak with her mother. When Mother came to the door, the men introduced themselves as Seventh-day Adventists. They prayed with Tenira and Mother and invited them to evangelistic meetings at their church. Mother looked embarrassed. She had been raised an Adventist but no longer was a member of the church. “But who are Adventists?” Tenira persisted. Those ideas sounded unusual and interesting to Tenira. She had only gone to church a few times—when friends had invited her on Sundays. She and her mother wore jewelry. They had never discussed whether their food was clean or unclean. [Ask children to identify unclean food.] Mother sometimes cooked pork— that’s an unclean pig! She and her mother went to the meetings every night. She liked the meetings. The preacher only spoke from the Bible. Every time he presented a belief, he showed that the belief came straight from the Bible. The preacher said God doesn’t want people to eat pork, and he read Leviticus 11:7, which says, “The pig … is unclean for you” (NIV). After two weeks of meetings, the preacher asked Tenira if she wanted to give her life to Jesus and be baptized. Tenira wanted to follow Jesus, and she was baptized. Mother respected her decision, and she stopped cooking pork for Tenira to eat. But after a while, Tenira had some trouble at school with the Sabbath. When she was in eighth grade, she needed to take a special exam to enter high school. The exam was very difficult, and her school offered extra classes to help the eighth graders prepare. But the extra classes were only on Saturdays. Tenira prayed about the problem and explained to her teacher that she could not attend the extra classes because she went to church on Saturdays. To her joy, the teacher excused her from the classes. Tenira thanked God for answering her prayer. But then she began to worry that she might fail the exam because she hadn’t taken the extra classes. She prayed about that problem, too. God answered her prayer, and she received excellent marks on the exam. Today, Tenira is 14 years old and the youth leader at her church. As youth leader, she plans special programs for about 30 children every week, and they also do missionary work such as picking up trash on the street and visiting people in the hospital. “My desire is to continue working for the Lord because I know I have a purpose in His house,” Tenira said. She is praying that her mother will be baptized, and she is certain that God will answer this prayer soon. “I have great faith in God because I knew that He cares for His own,” she said. Let’s pray for Tenira and her mother, and that many people in their country of Belize will hear about Jesus. We can also help share the gospel in Belize by giving to the mission offering.